Join a morning guided sightseeing tour of this magical city that was worshiped by gods and people. The bus will pass through the centre of the modern city where the must-see places are located, and when you finish you will feel that you have seen the best of Athens, including the Acropolis and the New Acropolis museum. Home of the first modern Olympics in 1896, Athens has been continuously inhabited for over 7,000 years. It is one of the oldest cities in Europe and it had a great impact on the European continent. It is the birthplace and the cradle of democracy and western civilization. It is also the birth-place of most of the wise men in western philosophy, western literature, and significant mathematical principles. 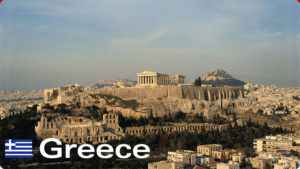 PRICES: All travel agents, in Greece and worldwide, offer the same tour at different prices. We are sure that our prices for this tour is not matched by any other company. After 60 years organizing tours throughout Greece we have secured the best deals in all aspects of travel. So, why pay more? Our discounted price, per adult, for this tour is: 38.00 € + applicable entrance fees. JANUARY – DECEMBER, Juniors under 19 and European Union students are free of charge. The tour combines modern Athens with the city’s ancient sites. See the Tomb of the Unknown Soldier in Constitution Square, The old palace of the Bavarian King, Otto, that today is the Parliament of the Hellenic Republic, and the all marble Panathenaic Stadium. Drive in front of the huge Temple of Olympian Zeus and learn about the glory of ancient Athens. 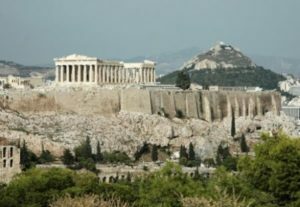 Finally, climb to the top of the Acropolis hill and see the world-famous Pantheon temple, the Parthenon, while you listen to the expert guide, about all its incredible features. At the top of the list of all Athens attractions, the greatest and finest sanctuary, dedicated to goddess Athena, the city’s patron, dominates the center of the modern city from the rocky hill known as the Acropolis. 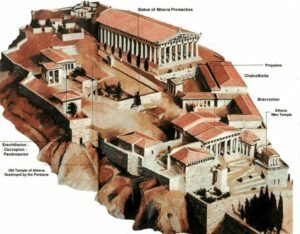 The Acropolis of the 5th c.BC is the most accurate reflection of the splendor, power and wealth of Athens at its greatest peak, “the golden age of Pericles”. The Acropolis is a flat-topped rock that rises 150 m above sea level in the city of Athens, with a surface area of about 3 hectares. It was also known as Kekropia, after the legendary serpent-man, Kekrops, the first Athenian king. The Acropolis and its magnificent monuments: the Parthenon, the Propylaea, the Temple of Athena Nike and the Erechtheion with its Porch of Maidens. It is the symbol of Athens, the sacred rock, the connection between ancient and contemporary civilizations. The monuments that stand today on the Sacred Rock date from the prehistoric period up to ancient times. There is not even one person (Greek or foreign visitor) that does not want to pay due honour to this sacred rock and see its beauty and glory. Visit also of the New Acropolis Museum, and see the original statues which decorated the Acropolis of the 5th c. B.C. A visit to the sacred rock of the Acropolis and the new Acropolis Museum is a must and an unforgettable experience. Dominating the Athenian skyline, this beautiful monument is dedicated to Goddess Athena, the patron of Athens. The consequences of the Persian invasion at 480 BC, lead Athenians to the desire of constructing a memorable temple in 438 B.C. by the architects Ictinus & Kallicrates, under the supervision of sculptor Phedias, which is considered to be the most important surviving monument of the ancient world. Parthenon which is the most brilliant construction during the Golden Age (5th BC) of Pericles, stands as a symbol of Ancient Greece & the Athenian Democracy. Its’ metopes & pediments representations depict scenes from Greek mythology; Parthenon is regarded to be the landmark of Greek history & culture. A plan to undertake large-scale conservation and restoration on the Acropolis, is still in progress. Depart for PANATHINAIKO STADIUM, where the first modern Olympic Games took place in 1896 (short stop). ACROPOLIS (visit Propylaea, Temple of Athena Nike, PARTHENON and Erechtheion, and finish the tour at about 01.30pm, with a visit to the New Acropolis museum. 07:30am The pickup service bus starts from central hotels and brings everybody to the terminal. From here, near Syntagma square area, your tour of Athens begins at about 08:45am. As the bus passes the top Athens’ attractions, the professional tour guide talks about the historical importance of this glorious city. You pass by the Greek Parliament building with the Tomb of the Unknown Soldier (this was the first palace of Greek King Otto in 1834), the all marble Stadium, where the first modern Olympic Games in 1896 were held followed by driving on Panepistimiou Avenue and the so called trilogy of Athens: The old University, the National Library and the Academy, 3 beautiful neoclassical buildings, built by the Bavarian architects that Otto’s father, king Ludwig of Bavaria, (1825-1848), brought with him to Greece. See the gigantic temple of Olympian Zeus — completed in the 2nd c, AD, and Emperor Hadrian’s Arch, before you arrive at the masterpiece that everybody admires: the Acropolis with its monuments. Stroll up to the site that served as the citadel, and walk around the buildings as you hear about its glorious days during the 5th c. BC. Explore the Acropolis on foot, see the glorious Parthenon and the other highlights, such as, the Propylaea, the Temple of Athena Nike, the Erechtheion with the Karyatides. Take advantage of the free time and explore the rest of the site independently. Continue your tour with a visit to the New Acropolis museum, one of the world’s finest museums. Your ticket lets you stay as long as you wish inside the museum. So, after the end of the guided tour you are allowed to stay and explore the museum on your own. Walk around the spectacular Parthenon Hall with the incredible sculptures. See its incredible friezes, and the other archaeological exhibits. Wander around in the galleries. There are more than 4,000 ancient objects to view and admire.